The diverse options in the USB flash drive market reflects the array of use cases that people factor into their buying decisions. Getting the biggest flash drive doesn't always make the most sense. Maybe you need one flash drive for school projects and another for backup purposes at home. Both cases need to be analyzed individually to know what kind of flash drive to buy to best fit those situations. How Big Should the Flash Drive Be? The capacities of USB flash drives range from under 1 GB to 1 TB and more, but no simple formula exists for estimating your storage needs. The size of flash drive you choose to get should depend primarily on what you need to store on it. Terabytes (TB), Gigabytes (GB), & Petabytes (PB): How Big Are They? For example, someone needing to transfer a few files from one computer to another might not need even a 1 GB flash drive. However, if you plan to use the flash drive to store file backups, you could need anywhere from a few gigabytes to 500 GB or more; again, depending on what you need to store on it. For a quick refresher, here are some points to made about file sizes (in order from smallest to largest): documents, images, music, videos, software, video games. In other words, if you plan to store only documents or images, you don't need a flash drive as big as one that will store video games or computer software. However, with that being said, only you can know for sure just how much space you need on a flash drive. Do some digging around on the files you plan to store on the drive to know just how much space they're currently taking up, because they'll take up the same amount of storage on the flash drive that they do now on your computer. If you're a student who needs portable storage for Word documents and Excel spreadsheets, you can be sure that they usually take up very little space. In this scenario, you'd be safe with a 2 GB drive. As another example, if you plan to use the flash drive to store all the images and videos from your phone, go into your phone's settings and see what it says for how much space your media files are taking up. It could be anywhere from 1 GB to several dozen gigabytes depending on your usage. That's the same amount of storage you'll need on the flash drive, at minimum — you're likely to put more files on it in the future. Or, if you need to store the 20 or so MP4s from your computer on the new flash drive, highlight all of them and see what your computer says for how big the bunch is. Multiple that number by two and consider that the flash drive size you need (given that you're not planning to store other types of files on there, too, like music or documents, in which case the size requirement is even higher). While flash drives are usually very affordable, the price is directly related to the size of the drive — as the size increases, so too does the price. See this list of the best USB flash drives for some quick price comparisons of our favorite picks. When you are shopping for a flash drive, you'll also be interested in transfer speed. Whether the USB flash drive is USB 3.0 or USB 2.0 is what determines its speed. The USB type you choose depends in part on the device you're transferring from and the port you use. Confirm which USB standard the USB ports on your computer support before buying a USB drive. If your equipment supports USB 3.0, buy that kind of USB flash drive since its transfer rate is 10 times faster than USB 2.0 drives. Although the actual throughput performance of a USB device varies based on your computer's settings, in general, the theoretical maximum speed of a USB 2.0 device is 480 MBps whereas USB 3.0 is 4.8 GBps. In context, that means a 16 GB file, like a digital-video project, will transfer in less than a minute using USB 3.0, but take nearly nine minutes to transfer using the older standard. 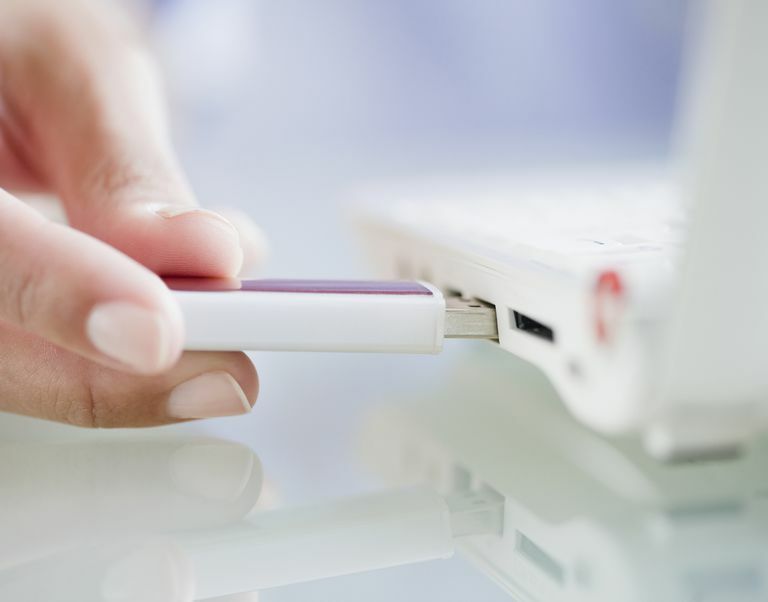 Depending on your usage, you might want to buy a secure USB flash drive. This extra capability might not be necessary if you're transferring just a few non-confidential files from one home computer to another, but if you're using it with many computers or are archiving important or proprietary data, you'll need to protect the privacy of the device. Their small size may cause them to be lost or overlooked. They are hard to track physically. Some companies ban their use for this reason. They can transfer malware from one computer to another and have done so frequently. Nothing can be done about the small size of the thumb drive without forfeiting its portability, but software encryption and hardware encryption help prevent malware transfer and unauthorized access. One way to go is to use full disk encryption programs which offer on-the-fly encryption of removable media.